I’ve missed the last few weeks worth of posts, you guys, but only because I’ve been on tour! 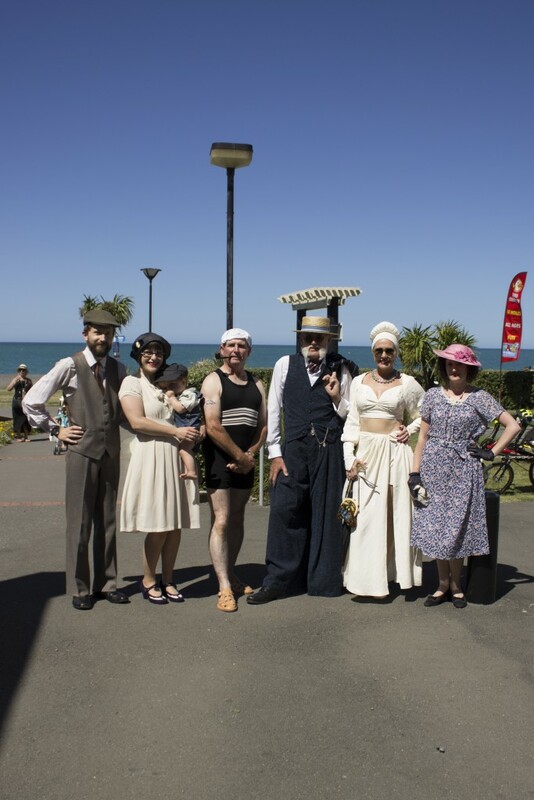 I left Auckland on the 17th of Feb, to head down to Napier for the Art Deco Festival (which was amazing! ), then headed back to Auckland for one day to take some promo shots for Moxie Mama, before jumping back on a bus and heading to New Plymouth for the Americarna Festival! I got back just in time for Uni to start, and I haven’t stopped since! I missed a few weeks of posts for the NZ Style Curvettes while I was away – ‘ Date Night’, ‘Style Crush’ and ‘Red’ – But not to worry! I did manage to get some outfit snaps while I was away, and they still kinda fit the briefs…..! 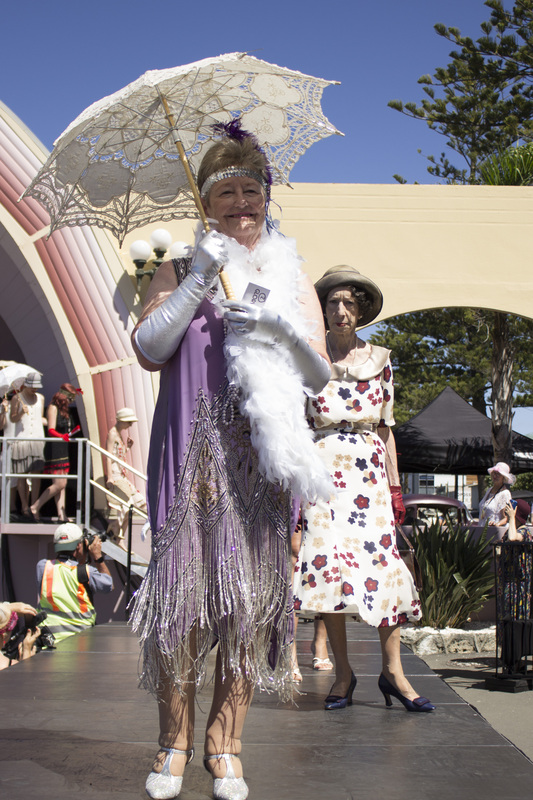 Anyway, this post is all about the weekend I spent in sunny Napier, for the Art Deco Festival! 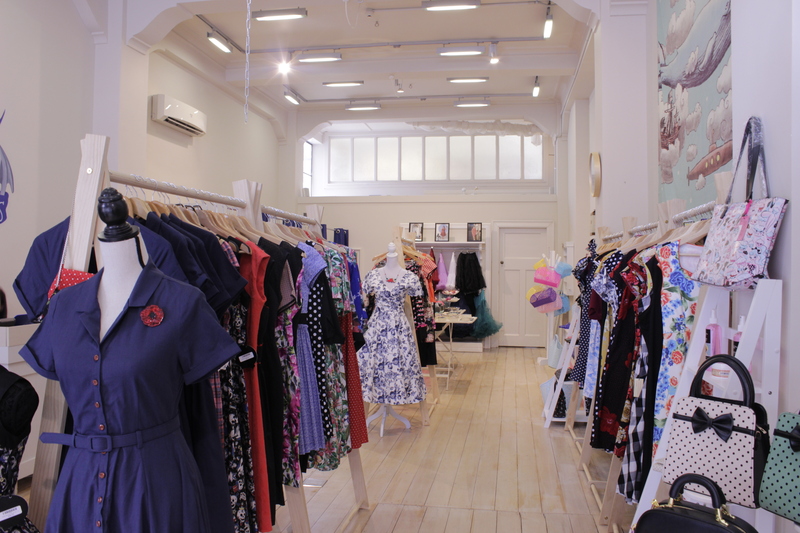 I spent the weekend snapping some photos for Glory Days, as well as taking early-morning hair and makeup bookings, and running a walk-in pamper parlour at Two Lippie Ladies! The winners of the Glory Days Costume Competition! As most of you know, I don’t usually have much of a Deco influence in my wardrobe – I tend to stick to a more 50s / 60s silhouette, because that works best for the shape of my body. 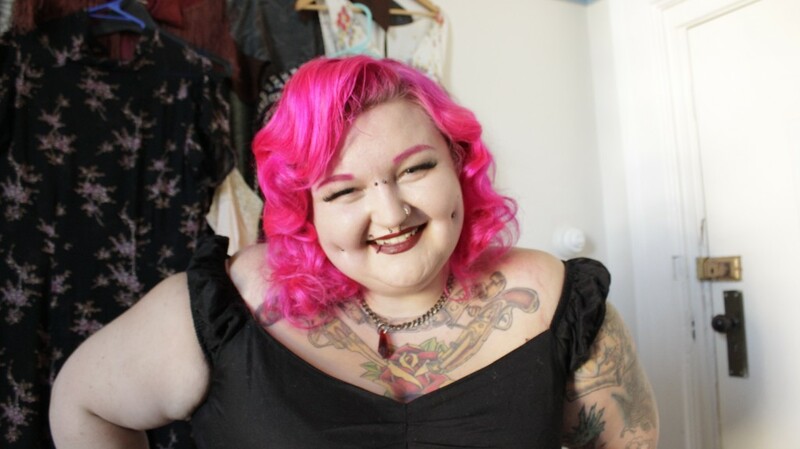 Obviously there are many great plus-sized deco enthusiasts, who manage to find things that look spectacular on them, and I do love the styles of the 20s and 30s, just not on me. And that’s fine. Of course, the issue was that if I didn’t dress up, people would look at my 1950s dresses and assume that I had dressed up and got it wrong, rather than realising that this is just how I dress. And there are a lot of purists at Napier Art Deco. A lot. Going through my wardrobe to find things for Art Deco was tricky – I have a few dresses with straight skirts, and a spectacular pair of palazzo pants, that have a ‘Beach Pajama’ vibe about them, but everything was black, or black and deep red. I’m not the biggest fan of black – I feel like it drags my mood down something fierce, which isn’t ideal when you’re interacting with people every moment of the day! As far as the week’s theme was concerned – ‘Date Night’ – I did manage to find some things that were, at the very least, deco-inspired, and were actually pretty respectable! 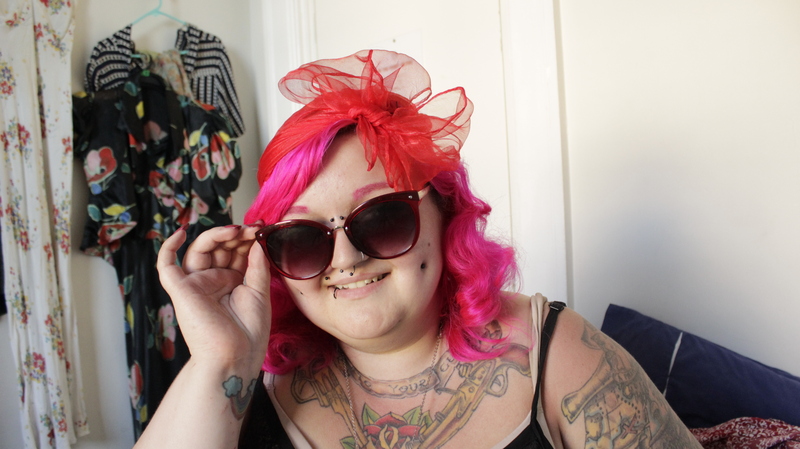 All three of my outfits would be something I would be content to wear on a date, or anywhere that I had to be a bit fancy, so without further ado, here are my deco picks! 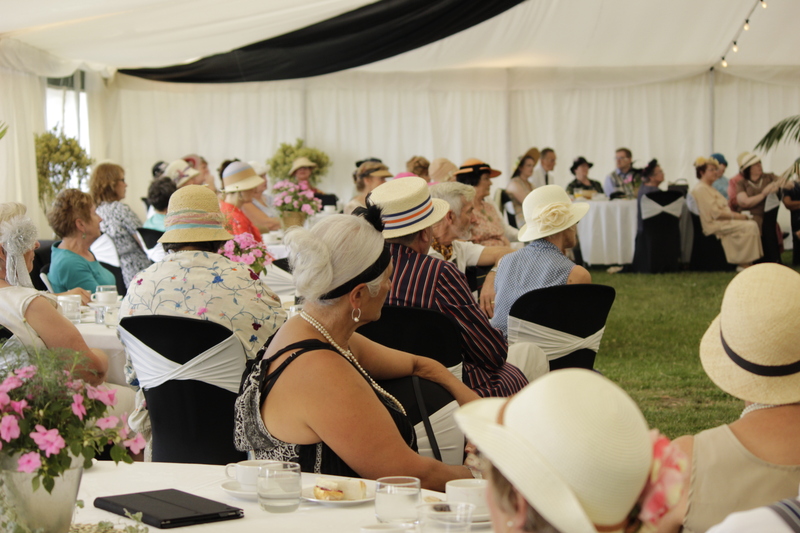 I arrived in Napier on the Thursday evening, and after 10 hours on a bus, had absolutely no desire to get dressed up, so my Deco Outfits kicked off on Friday morning! 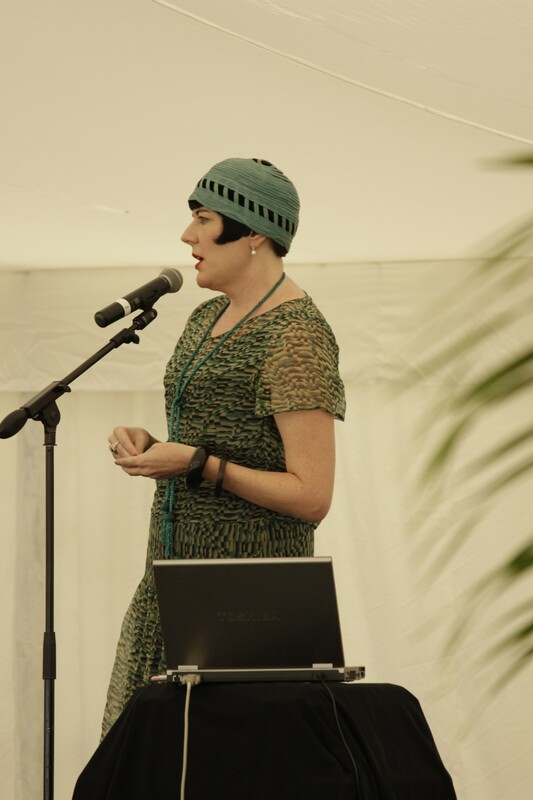 Claire and I were helping to teach a workshop in the morning, doing quick-and-easy Deco Hair and Makeup, following on from a spectacular talk by Inger Sheil on Art Deco Fashion and Styling. Anyone with any interest in historical costuming should really follow Inger on, like, everything, because she is a fount of knowledge, and always looks absolutely on point! We had 70 people in the audience, which was awesome, but also a little terrifying! Remember, these people were the purists, and I had to stand up in front of them and talk about ways to cheat at fingerwaves! 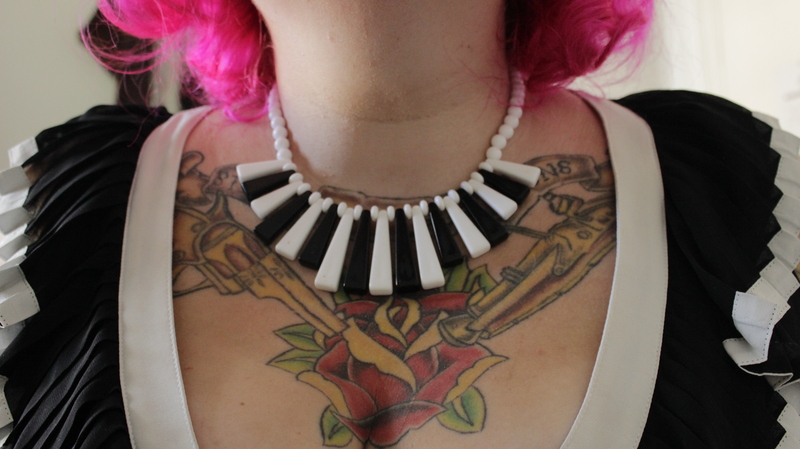 I wore this black and white pleated dress from City Chic, as it is the closest thing to a deco-inspired dress that I own, and it has quite a straight skirt, so it’s definitely less of a 50s silhouette than I usually wear. Plus the style name is “Charleston”, so it seemed appropriate! I bought it initially to wear to my Mama’s wedding a few years ago, and haven’t really worn it since, but it’s gorgeous and way more comfortable than I remembered, so I’ll definitely have to wear it more often! I matched it with a necklace that I bought from a friend, on a facebook Buy / Sell page, which seemed to fit nicely with my slightly caricatured interpretation of Art Deco! 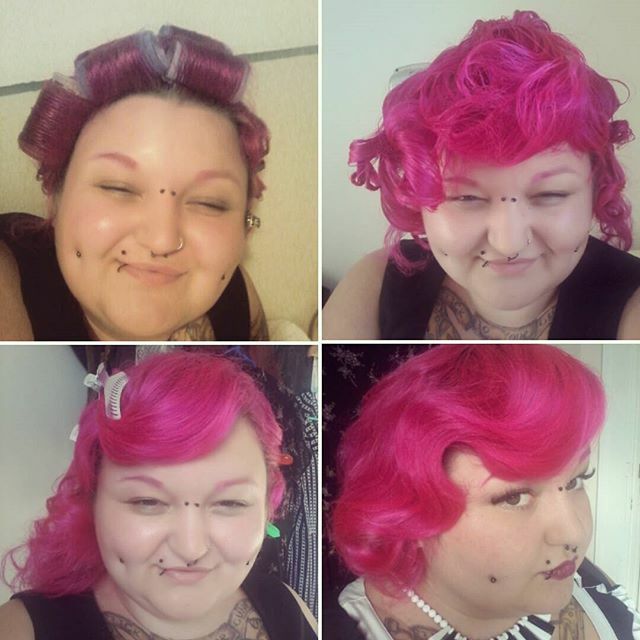 I set my hair with some deep waves and pincurls. This was achieved by setting my hair with a few lines of velcro rollers, alternating the direction of the rows, and doing the rest with pincurls. I leave the clamps in place while I do my makeup, which gives the spray time to set, and keeps my hair off my face while I’m doing it! The advantage to a set like this was that, with careful pinning at night, I could keep the same hair for the duration of the festival, saving time in the mornings! 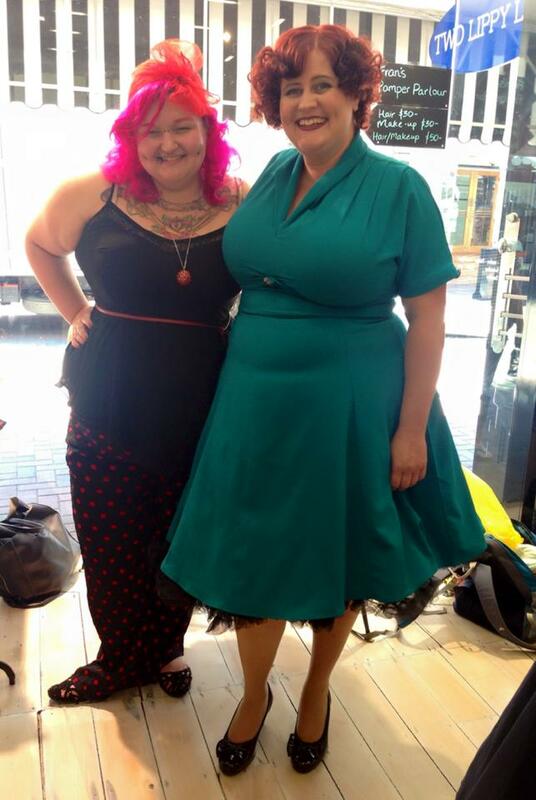 After I finished up at the workshop, I toddled on off down to Two Lippie Ladies, to spend the rest of the day there, taking walk-ins for hair and makeup, and just generally nosing around their gorgeous shop…. 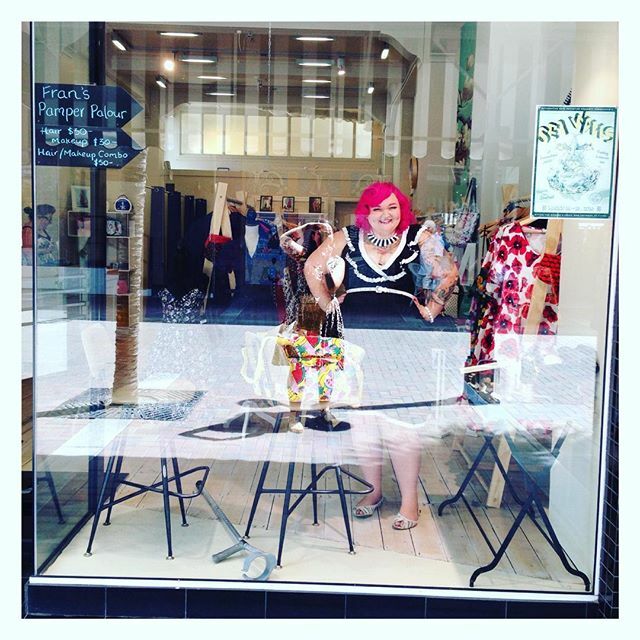 ….where I got to spend the day as a window display! Now, I don’t know about you guys, but usually after a full-on day of work, all I want to do is lie down and die! Unfortunately, I deemed it more socially acceptable to go and have a wander, and meet up with the Glory Days team down by the Sound Shell to get some dinner and listen to music! 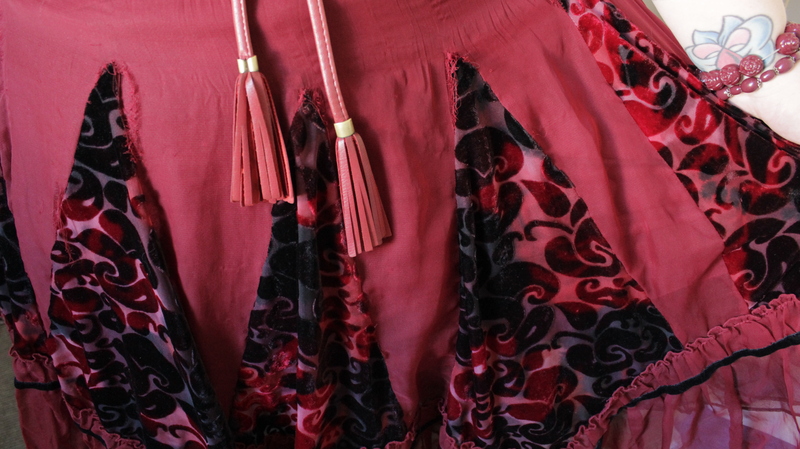 I decided to wear this skirt, that my Mama bought me from Ballantynes in Christchurch on my 16th birthday! It has a sheer chiffon over-skirt with cut-in flocked panels that create a kind of jagged hemline. On most people, this is a straight skirt, so I figured it would be perfect for deco, despite being a little short. 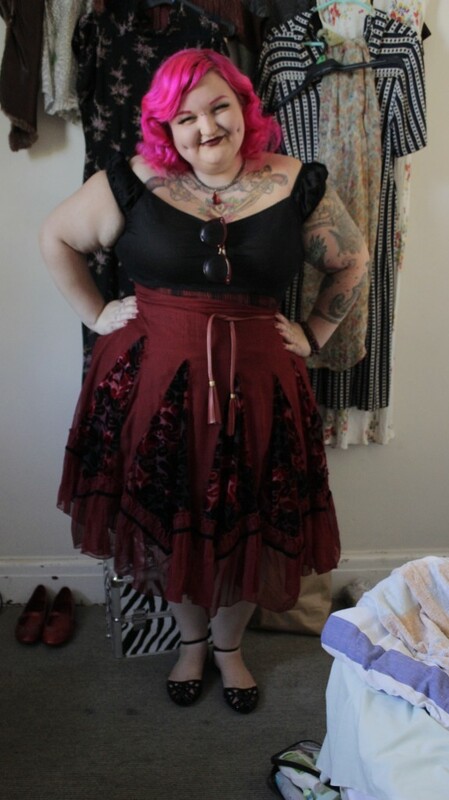 Unfortunately, with such a difference between my waist and hip measurement, there’s no such thing as a straight skirt, so I did have a few snide comments from the purists about my not-historically-accurate silhouette….but I’ve got pink hair and tattoos, so surely it was obvious that historical accuracy isn’t really my forte! 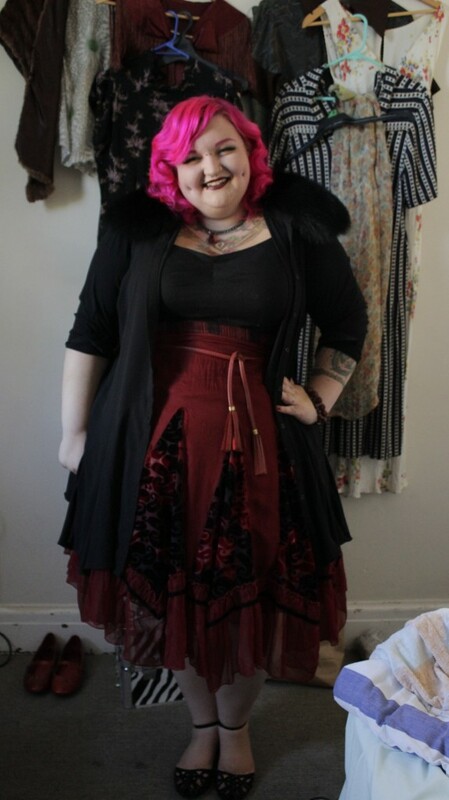 I paired it with my black Collectif Delores Doll top, and a super plain crystal drop necklace, and brushed my hair out a bit so the waves were looser. I also finally got a chance to wear these super cute velvet cut-out slippers, which were crazy comfortable and covered in rhinestones! 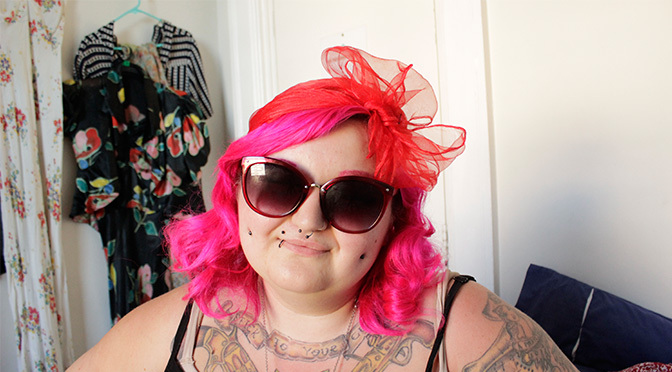 I got them from Kmart aaaaaaages ago and then had nothing to wear them to / with, as I don’t really wear black, but they worked well with my deco outfits! I also intended on wearing this spectacular chiffon dress coat, with a huge big super-luxe fur collar, but holy hell, it was too warm for that sort of nonsense, so it stayed in my bag all night! I walked along the beach, and had empanadas, and it was all pretty lovely! And then I went home to bed quite early, because I am secretly an old lady. Holy hell, you guys, I did not realise this was so out of focus. I’m so sorry. Only explanation I can offer is that it was before 7am and I was wearing sunglasses inside, so I probably couldn’t see the LCD screen on my camera very well. 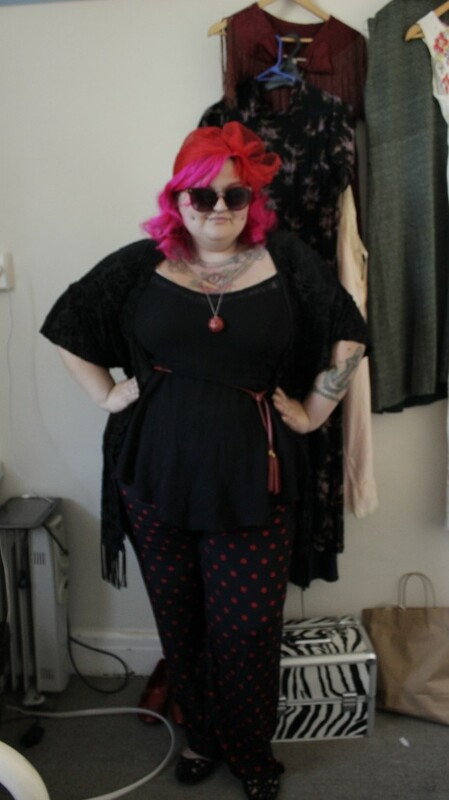 I wore a City Chic two-layer bias cut chiffon top, with my Wild Child Palazzo pants, that I bought from Farmers a squillion years ago, with absolutely no intention of wearing them out in public! They’re spectacular though! They have a really great fit through the thighs, and are made from a nice lightweight cotton/polyester blend, which basically made them the perfect faux-beach pajamas for a full-on day of hair and makeup, and photography, and just generally running around like a headless chook! I started off wearing a flocked/fringed jacket thing, but it was a super warm day, and that rapidly got relegated to the handbag! Aaaanyway, this was my big huge very long day. So huge. 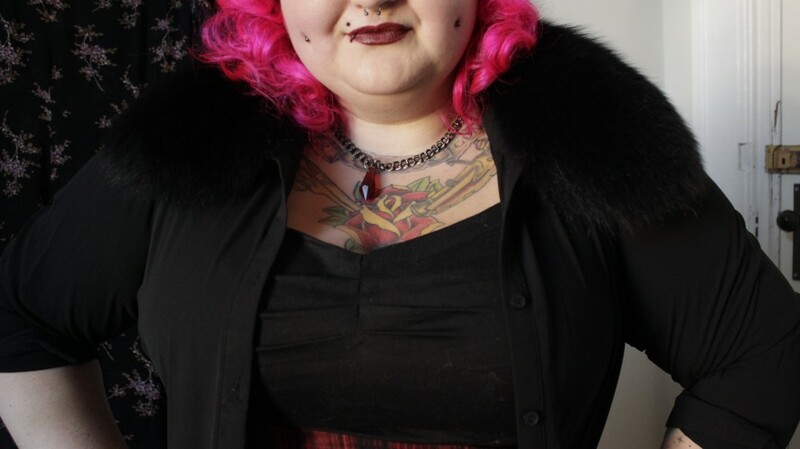 I had my first hair appointment at 7am, in the lobby at Toadies, and worked there until 10. I think I managed to fit in 4 hair-and-makeups 4 hair ups, and 2 makeups, which was quite a lot for 3 hours! Gorgeous Pam was my last client for the day at Two Lippie Ladies! I then wandered on down to Two Lippie Ladies again, and worked there from 10 until 1.30, before packing up and heading down to the Sound Shell to shoot the Glory Days Costume Competition! There were some amazing costumes, so feel free to check out all the shots on the Glory Days Facebook Page, but here is my absolute stand out shot…. As far as I’m concerned, this is the one photo that totally embodies the Art Deco Festival. There’s a lady up there, with her sequinned headband, feather boa, and costume opera gloves, looking thrilled with her outfit, despite the wild historical inaccuracies, because she’s just having fun and is totally owning that outfit…….and right behind her is a lady who is dressed head-to-toe in authentic / replica deco, also looking spectacular, but thoroughly disapproving of the lady in front. I just love it so much. It makes me so happy. After the competition, I went straight back to Toadies for another few hair / makeup appointments, and then immediately gave up and went to bed to read my book as soon as my appointments were over for the day. I had crazy sunburn, and I was super sore and tired, so I decided to conserve energy and have an early night……and I don’t regret a single part of that decision! The following morning I jumped on a bus back to Auckland, and slept like a log most of the way home, which made for some quality games of “Where in the North Island am I now?” whenever I woke up and looked out the window, paranoid that I might have slept through Auckland and wound up in Whangarei or something! But oh man, you guys, I had an absolute blast at Deco! I do wish I’d explored a little more though, so I’m definitely going back next year! I’ll be back sometime in the next few days with a recap of my shoot with Von Vonski and Moxie Mama, followed by my recap of the Americarna Festival in New Plymouth, so keep an eye out!